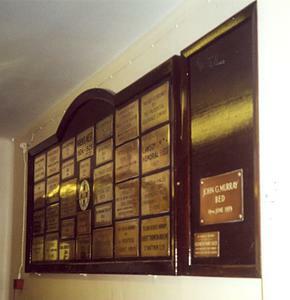 Three hospital beds commemorated by brass plaques on a wooden board. IN MEMORY OF THEIR COMRADES WHO FELL IN THE GREAT WAR 1914-1918. FROM EX-SERVICEMEN OF THE HATFIELD DISTRICT.